AFRICANGLOBE – Just an observation: Ever notice how the cops NEVER shoot or kill effeminate looking Black men? When was the last time you heard about some brother wearing mascara and leggings getting gunned down by the cops? Mike Brown: a masculine looking brother, about to start his first day of college 2 days before gunned down by a cop. Sean Bell: looked like a true masculine brother. About to marry a Black woman; attending a bachelor party with his male friends, like many guys do; when the cops walked up on him in plain clothes and emptied their clips into him and his friend. Shot the brother over 50 times, like they were trying to kill an animal, only pausing long enough to reload their weapons and shoot some more. Even Trayvon Martin looked more masculine at 17 than some of these soft dudes I see walking around today…looking like they just auditioned RuPaul’s Drag Race. It took a man weighing 250 LBS to subdue a boy who weighed about a buck 50 soaking wet, 6 jurors, a bullet and an entire news network (Fox) to take one average Black kid and turn him into a deranged Black beast worthy of death. They did the same thing with Mike Brown later. Again, think on it: when was the last time you recall hearing about some soft looking Black male getting shot by police or some white vigilante? It should be obvious by now: true Black masculinity is under attack here in America. Like never before. Global 2000 is in full effect: the name of the game is population control. And yes, I’m connecting the war on unarmed Black men with the gaying of Black culture, because it’s the same dang war being fought on two different fronts. What do you do with a group of people you no longer need, who have increased in numbers that are growing daily? Simple: You cull their numbers back. That’s the ONLY reason why the gay agenda is pushed so strongly in OUR community over anyone else’s. It’s not about anyone’s right to be gay or get married. Those are smokescreen arguments. What’s being pushed is a deliberate agenda. That’s why you’ll be hard-pressed to find a so-called reality show on TV geared towards a Black audience, that doesn’t have gay dudes all on it. You can’t even have America’s Next Top Model without having gay Black dudes on it, showing the women how to look and act more…feminine! They’re seeding the minds of people with these alternative lifestyles because it’s an excellent silent weapon for a quiet war. Oh, you didn’t know you were in a quiet war? Better do your research on the Global 2000 report and the Georgia Guidestones. Somebody has a vision for the future of this world; and you’re not in it. Specifically target Black men. They are the seed carriers. The ones you can’t lock away for crazy years in prison, or kill out right on the streets for ‘looking’ threatening…convince them to engage in homosexuality. Push it as a viable and acceptable lifestyle choice. An article in the UK Daily Mail recently highlighted how white Americans are less likely to be gay than…well, just who do you think made the list as the MOST likely group of Americans to be gay? Some might call this a random happenstance. 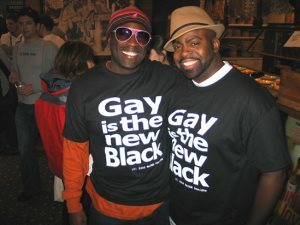 As if Black men are somehow suddenly just prone to homosexual outbursts. I argue CONSPIRACY. And don’t worry Black folks in Europe, Africa and the Caribbean: a similar program is headed your way too. Again: the goal is to control our numbers by reducing our birthrates. And judging by the softening and redefinition of the Black male’s image in society today, they should be right on target with their goal.